After welcoming those present I started the evening by explaining why I am so passionate about education and my dismay at how the National led Government has dismantled much of what made our public education system great. I used a my blog post that has been widely shared as a basis for my presentation. I openly admitted that I had a depressing picture to paint but reassured the meeting that Metiria and Catherine would follow with a positive message. 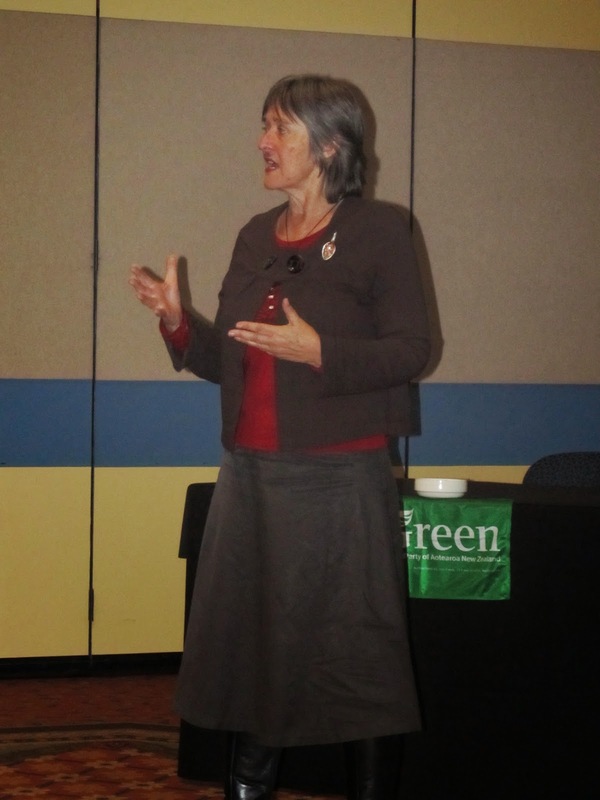 The Green Party see education as one of the most important portfolios and not only do we have a co-leader as a spokesperson but Catherine Delahunty is an active education spokesperson too. Both have strong connections within the sector and have built huge credibility over the years. Metiria has had first hand experience of what it means to bring up a child with limited means and her memories of being a young single mother have never been forgotten. For parents on low budgets and with limited transport options, to have their local school operate as a hub for after school care and community health would remove the stress of coordinating time and transport to access different services. The other advantage of having multiple services on the same site would be the improved communication between them and the potential to save money from unnecessary duplication. Currently teachers in lower decile schools are having to address a whole raft of issues that children bring with them each day and having a dedicated School Hub Coordinator to manage supporting services would allow teachers to get on with the job of teaching. Such a role would make more of a difference to children with high needs than one of the Government's Executive Principals. Learning cannot occur if a child's basic needs aren't met and with 285,000 children living in poverty, there are many who need more targeted support. Catherine Delahunty spoke strongly about the importance of communities being able to decide what services would best meet their needs and having input to how they would operate. She was particularly concerned about the Government's support of corporates to provide child services. Catherine referred to the Government's subsidising of Kidicorp to provide early childhood centres in low decile communities despite the corporation having such a chequered history. The evening ended with refreshments and an informal chat with Catherine and Meitiria, who were very interested in hearing about how attendees saw the hub concept operating in Invercargill. The Green Party is solutions focussed and it was great to launch our campaign with an initiative that is getting such strong support. Looking forward to an effusive and positive article in tomorrow's Southland Times, Dave. I would like to say that there would be, but Southland Times Journalists aren't able to work weekends any longer. I did send something to them, however, and have done the same for the Southland Express.